In the pre-oil era, the states of the Arabian Peninsula were embryonic and social formations like tribes and merchant classes enjoyed high levels of collective autonomy. Oil-based state formation has reversed the pattern: states are omnipresent and social groups have become subservient to and dependent on them. The history of Arabian state-building is a history of the political decline of independent social groups – and tribes, however important they remain as social identity markers, are at the sharp end of this process. With the expansion of state administration, state services, state-orchestrated distribution of rents and the state-imposed monopoly of violence throughout the twentieth century, social groups have lost their independent economic basis and ability to self-regulate. Merchants lost their function as provider of loans and taxes to the state, and as provider of embryonic public services such as schools, hospitals and electricity provision to the population. Tribes lost their pastoral economy and their ability to raid settlements and provide security to caravans. While merchants could continue to do commerce and provide services in a growing oil-driven economy, tribes lost all their essential political and economic functions. The winners of oil-driven modernisation were better-educated urban residents – often of tribal extraction, but not representing their tribes in any systematic way. Tribespeople outside of the urban centres experienced a reversal of status, with few economic opportunities for them outside of the security forces, where tribal structures sometimes reproduced themselves, but under the watchful eyes of the state: While tribal networks sometimes managed to “colonise” parts of the state apparatus such as the National Guard in Saudi Arabia, their access to the state and its resources was always granted by the ruling family and could be taken away if needed. In other parts of the state apparatus, rulers often deliberately relied on advisors with no tribal background, because these had no collective status group to fall back on and hence were completely beholden to their masters – not unlike janissaries or mamluks in the Ottoman Empire. To the extent that tribal elites cooperated with the emerging state, ruling families often co-opted them into their networks of patronage. They locally empowered select sheikhs through the assignment of administrative functions (e.g. giving them the right to attest individuals’ personal status) and the ability to act as intermediaries vis-à-vis the state on behalf of their tribe. These local privileges have declined over time, however, as states have grown and increasingly become able to reach out to all parts of society directly. While the emergence of the modern state has empowered ruling families at the helm of the state apparatus, it has undermined traditional social elites whose function as social intermediaries and community representatives has declined. Tribal leaders still exist but have little independent power and often enjoy limited prestige within their tribes. In Oman and Saudi Arabia, they are on the payroll of government, reflecting their dependence on state largess and recognition. In Saudi Arabia, the state has also taken over the management of genealogy, the tool through which tribal identity is organised (and often re-organised). The Ministry of Information has publicly declared that no one bar officially recognised tribal and religious leaders are allowed to use the honorific “sheikh”. In contradistinction to the traditional practice under which tribal leaders were chosen within the tribe, the Ministry of Interior is in charge of designating who is a sheikh and who is not. As Nadav Samin has documented, the Ministry of Interior took control over genealogy and individuals’ ability to determine their tribal names in the 1990s (following the emergence of a large genealogical “industry” that was in parts triggered by the 1969 decision to force all Saudis to adopt a four-part name that would reflect their tribal origins, if any). Tribes have largely lost their ability to collectively mobilise vis-à-vis the state. Tribal delegations were able to brandish their weapons in front of the governors’ palaces in the early oil age to underline their demands. With the exception of Kuwait, Gulf oil monarchies nowadays do not allow public collective action – and certainly no demonstration of non-state coercive resources. The loss of tribal autonomy and economy have been a source of some frustration for young tribesmen. As Abdulaziz Al-Fahad has documented, their emasculation has been lamented at some length in tribal poetry. Some young tribesmen have found a new outlet for their pent-up masculine energies in Salafi Islamist mobilisation or among communities of urban car “drifters” – both of which are a concern for state authority, but not an existential threat. While tribes have lost collective agency and autonomy, both real and re-invented tribes remain very important as social identity markers. Tribal status often determines marriage patterns: Saudi Arabia has seen a string of lawsuits in which relatives of young couples asked for marriages to be dissolved in grounds of tribal incompatibility. Courts have on several occasions given in to these claims; they have recently been instructed by the Supreme Judicial Council not to do so. Resolution of private conflicts and pardons are sometimes still organised through tribes, often in conjunction with networks of (highly paid) intermediaries – although different from the pre-oil era, ruling family members typically take the final credit for adjudicating disputes. Tribal networks can influence hiring and interactions between citizen and state on a day-to-day level. While tribes are rarely allowed to act collectively, low-level, individual interactions with the state still can be inflected by tribal identity. Gulf states behave ambiguously vis-à-vis tribes: Tribal culture is valorised and appropriated as part of a growing national identity industry. Yet tribes are also seen as a latent threat to the state and as a source of social divisions, undermining cohesive national identity and the technocratic meritocracy that rulers espouse for their societies. We hence see both numerous state-endorsed folkloristic festivals and tribal poetry competitions, but also proposals from the Saudi Shura Council to delete tribal names, and official decrees to ban tribal slurs from the kingdom’s National Camel Festival. During the kingdom’s municipal polls in November 2005, candidates were prohibited from using “historic or tribal names”, reflecting continued unease about tribes as political entities. The Saudi Council of Senior Scholars has banned the creation of tribal income support schemes, showing their distrust of tribal self-organisation. As long as states are strong and authoritarian, tribes will remain weak. The experience of Libya, Iraq and Yemen has shown that tribal networks can re-emerge as political actors when the state is weakened, though not necessarily under the control of old tribal elites. But such weakening is an unlikely prospect in the GCC. That said, moments of crisis often trigger tribal reflexes: Saudi Crown Prince Mohammad bin Salman mobilised tribes for a showing of loyalty in the Eastern Province in the early stage of the Qatar crisis. The Saudi and Emirati governments have been trying to mobilise dissident tribal factions against the Qatari government (with little success). On the Qatari side, tribal leaders publicly pledged their loyalty to the Qatari emir after the onset of the boycott. 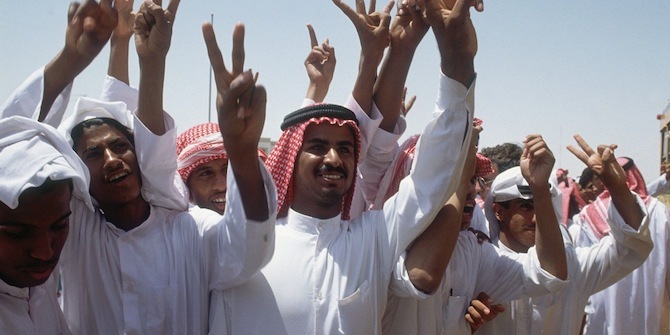 The political decline of tribes in the GCC’s authoritarian countries is part of a broader process in which oil-financed states have deepened their infrastructural power to the detriment of independent status groups and intermediary elites. Tribes have been hit the hardest in this process – making the boom of a tribally-inflected national identity industry all the more ironic. Steffen Hertog is Associate Professor in Comparative Politics in the LSE Department of Government. He has been researching the comparative political economy of the Gulf and Middle East for more than a decade, working with a number of local and international institutions.